Three Dimensional View Stereo microscopy is a type of light microscopy that uses a light source to reflect light onto the surface of the sample, and is designed for low magnification observation. Two viewing and objective pieces are used to give the user slightly different viewing angles for each eye. This design allows for a sample to be viewed as a three dimensional image, rather than the two dimensional view that is observed with a single objective piece. For this reason stereo microscopy is often used to study the surfaces of solid samples such as during crack failure analysis and quality control analysis. Typically the light source used is an optical fiber light source with a halogen bulbs, this allows the user to readily adjust the angle of the light. Light adjustment is important for highlighting/illumination due to the 3-D nature of samples. A fixed light source can cause shadows on the areas of interest that are at a lower depth than other section on the surface of the sample. 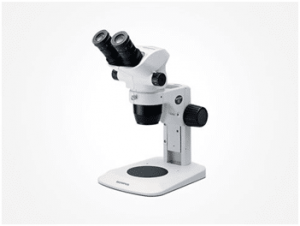 Generally, if you require less than 100 x magnification observations and the sample is three dimensional, or you hope to manipulate, dissect or work on a sample while under magnification, stereo light microscopy is the best option.